Amtrak has asked for special authority to install an automated braking feature at the site of last week's derailment in Philadelphia. The "positive train control" system has long been discussed, but implementation has stalled. According to federal regulatory documentation reviewed and reported by Reuters, Amtrak has requested approval of the Federal Communications Commission (FCC) for special temporary authority to employ a certain radio frequency to operate positive train control (PTC) in "the accident area." If the request is granted, Amtrak could operate at a radio frequency of 220MHz for up to 180 days at the site of the May 12 crash. Authorization could be renewed at the end of that period. Before that point, though, engineering studies planned in the next few days must determine if the frequency would hinder two Philadelphia television stations from broadcasting in the area, Reuters reported. The FCC review could occur as early as next week. Amtrak, meanwhile, said its attempts between 2010 and 2014 to purchase proper radio bandwidth on the open market were obstructed by litigation and regulatory process. 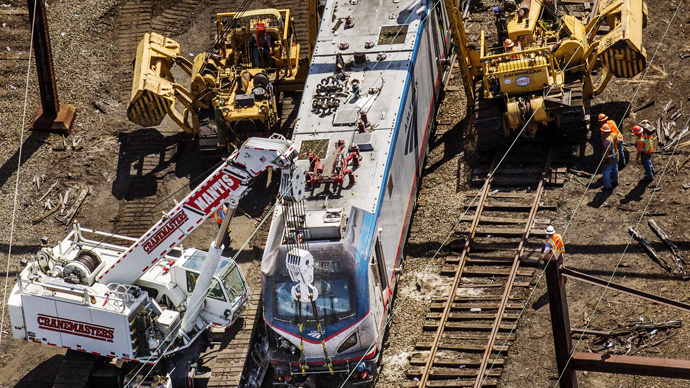 The Amtrak crash on May 12 in Philadelphia killed eight passengers and injured more than 200 others. The train was heading north from Washington, DC to New York, traveling twice the 50 mile-(80km)-per hour speed limit. The PTC rail system is depended on to slow and even stop trains to stem accidents, though it is not completely fail-safe. For decades, the National Transportation Safety Board has called for PTC installment along the nation's rail lines. It took a 2008 two-train collision that killed 25 people in California for Congress to move, passing the Rail Safety Improvement Act of 2008 that came with a deadline of December 2015 for PTC installment. The legislative effort was to address "derailments caused by over-speeding trains, head-on collisions, obstacles on the tracks such as vehicles at grade crossings, movements on a switch in the wrong or misaligned position or incursion into a work zone,"according to The New York Times. Most railroads are expected to miss that deadline, however, the Times reported. In the US Senate, there are two pieces of legislation that would extend the deadline to 2018 and 2020. Commuter railroads have been mostly supportive of improved PTC-based safety efforts. Yet, according to the Times, the freight industry has especially pushed for an extension of the deadline. The Federal Railroad Administration, meanwhile, has ordered Amtrak to install a system called automatic train control while PTC hangs in the balance. Automatic train control is a less-advanced technology that rail safety experts say can still stop accidents like the one on May 12, the Times reported. Amtrak has also promised to install PTC at least along the Northeast Corridor, if not in more locales, by the end of 2015. In March, Amtrak was granted approval from the FCC to purchase PTC wireless spectrum for the line that connects New York and Washington, a spokeswoman told Reuters. Thus, its latest request for special authority was not solely because of the accident last week. The rail operator, which is a federally-funded for-profit business, is scheduled to discuss its PTC plans at a press briefing on Tuesday.